Ever since humans invented writing, there has been a need to duplicate what has been written. From monks toiling away duplicating manuscripts through the printing press in the 15th century and to the invention of reliable carbon paper in the late 1800s, this had always been something of an effort. As the industrial revolution drove economies forward, being able to copy legal agreements, contracts, drawings and notes became more of an issue. Although all sorts of technologies existed for making multiple copies of something when they were being prepared (for example, carbon sheets in a typewriter or using a duplicating machine) if you wanted to copy an existing document then you were out of luck, and in all probability it would need to be copied by hand which was really just the same thing those monks had been doing. 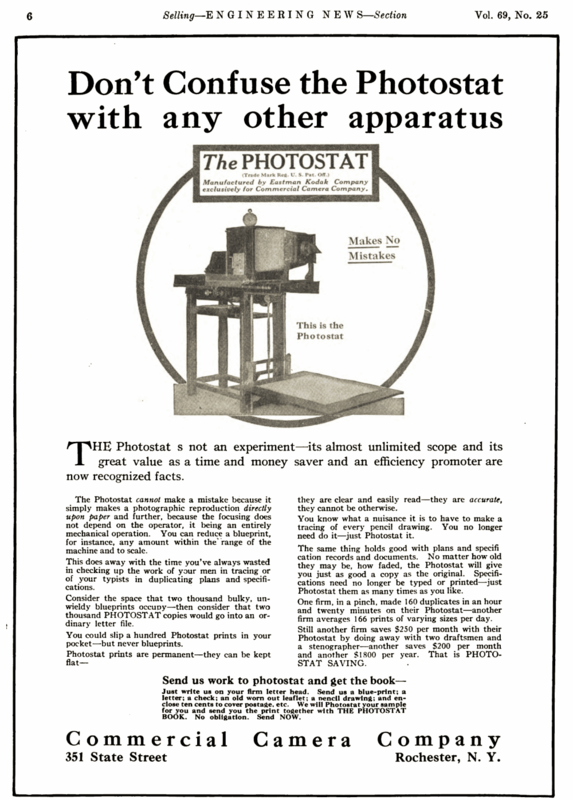 The development of photography in the 19th century brought new technologies to bear, and in 1907 the first Photostat machine was launched. 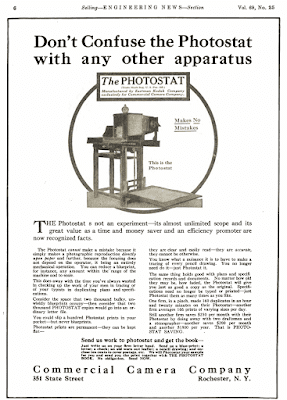 Simply put, the Photostat was a type of camera, but instead of projecting the image of whatever was wanted onto a film, it projected it via a lens and prism onto photosensitive paper. The catch was that this process produced a negative image of whatever was being copied, which was fixed by inserting the first copy back into the Photostat and producing a negative of the negative (i.e positive) version. These days we are used to digital photocopiers producing near-perfect copies of whatever we want, but the quality from a Photostat machine was not great. And if you copied a copy... well, it would become unreadable pretty quickly. Nonetheless it meant that if you had the original document, then you could produce readable, accurate and relatively inexpensive copies in a few minutes. The machines were not cheap, coming in at about $500 in 1911 (around $10,000 today) with costs-per-page being about 6¢ (around $1 today). They were also bulky and required a trained operator to use them, but they were a huge improvement over what went before. The commercialisation of xerography in the 1950s killed off the Photostat for good and formed the basis of almost all modern copiers and laser printers. But that is a story for another day.